If this year was everything you wanted, I bet you there are still things on your list worth checking off. You don't have to be grandeur to make a positive impact. You don't even have to break the bank to make a shift. I know many people don't like their 9 to 5, and finding avenues outside your job area can bring added meaning to life. When we shift our focus to being a change agent, something tremendous starts to happen within and without. The most valuable commodity we have is our time. In relationships we crave quality time. Time spent keeps people from loneliness and gives us a sense of belonging. Your time can be in the form of going to an old age home and reading to an elderly. Not everyone there has family or frequent visitors. Your presence is a gift that far surpasses loneliness. Recycling reserves resources on a planet we haven't always made a conscious effort to take care of. This can be one of the easiest habits to pick up, and by becoming Green Aware you are helping the entire planet one item at a time. Start at home. Things like paper, glass, tin cans, creating a compost heap, planting your own veggies and herbs are all ways you can begin to effect change. There is said to be over a million people diagnosed with cancer every year. And every few minutes someone in this world needs blood. When you give one of the most precious gifts there is to give in this world you are saving a life. Ask someone why they don't donate and they'll likely say they just haven't thought about it. If you're one of them, it's an easy process and shouldn't take more than half an hour of your day. So what do you say about giving the gift of life? You never know who you might be saving. Before you throw your leftovers away, consider the person at the stop street standing, begging for a warm meal. It's so easy to take for granted what we have. While we often throw leftover dish away, we could just as simply wrap it up and give it to someone on the way to work. Donate unspoiled food to a food bank in your area. These institutes are responsible for distributing food to areas of hunger. You can start by contacting one in your area. Note that each have their own donation guidelines, so do make sure to do your homework and stick to them. Another great way you can give is to volunteer in a soup kitchen. Soup kitchen volunteers offer a loving environment and offer warmth to those in need. Family holidays can be a painful time. By volunteering, you have to opportunity to bring that warmth to someone else. There has been a lot of controversy about where our clothes go after we drop them off in clothing bins, etc. Some clothes actually end up at the store, sold at a fraction of the price. It is up to us to do our homework before donating. Call up local churches and shelters in your area. Find an orphanage in need of clothes. Give to someone you know has less and will appreciate it. Whatever avenue you choose, know that your contribution travels further than you may think. Add in old blankets and towels too. Besides, regular spring cleaning is not only frees your closet of clutter, but cleanses your mind too. 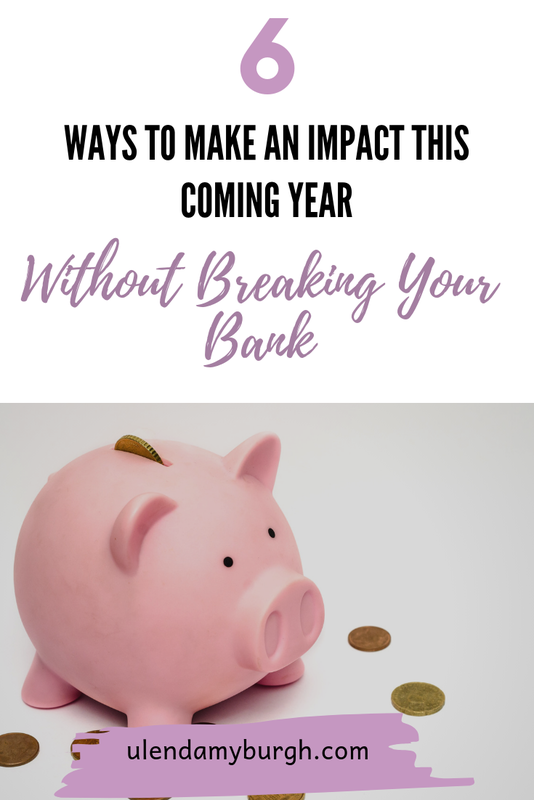 There are many ways to give without breaking your bank. And if you have bank to give, why not? After doing this you cannot tell me you're too small for this world.